Plums come in a variety of shades. 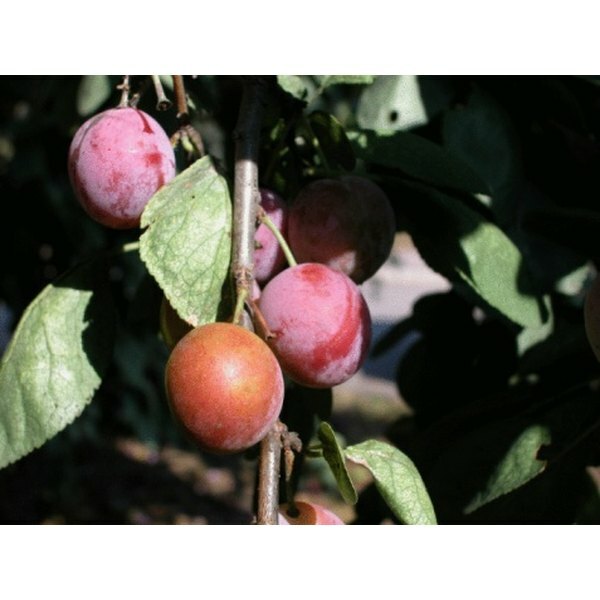 A plum is a sweet fruit that you can find in colors ranging from dark purple to a golden yellow. Plums have a soft inner flesh with a single stone or pit in the middle. Plums are a good source of vitamin C and fiber, and although eating them raw is the most natural way to enjoy a plum, you can cook them a couple of different ways to make special desserts like puddings or pies. Slice your plums in half by cutting into the plum and running your knife around the pit. Pull the two sides apart and remove the pit with your fingers. Place the plum halves on a baking sheet and sprinkle with brown sugar or spices like cinnamon. Slide the baking sheet into the oven and bake for five to seven minutes, or until the flesh is golden brown. Remove from the oven and top with whipped cream for a sweet dessert. Cut your plums in half and remove the pits. Cut the halves into quarters or eighths. Add 2 cups of poaching liquid such as water, wine or juice into a deep skillet or saucepan and place the pan on the stove over medium heat. Set the plums in the liquid and poach for 10 minutes, or until the flesh has softened. Remove the plums from the liquid and set aside. Serve the softened plums with ice cream, or positioned in overlapping circles on top of a plum tart. The shell is baked ahead of time and the tart is refrigerated after the poached plums are added. Peel the skins off the flesh with your hands after cooking if you want them removed.